This event is coming up this coming week-end. Weather permitting, on the Sunday morning I propose to be operating from Kamarun Lookout near the Lamington National Park (QG61NU) using all bands from 50 MHz to 76 GHz inclusive. In a different way from my usual pattern of FD operation, this time I will only be operating on the Sunday morning. I am planning to commence operating from there around 6:00 a.m., through until the end of the contest period. That means quite an early start from home that morning! I try as much as possible to keep 146.500 MHz and 439.000 MHz FM simplex open for getting in touch and for liaison for the higher bands. Of course, from time to time I will be operating on the usual SSB calling frequencies -> .150 in the 'busy bands'. Here's hoping that the weather for going portable is looking good, and that many of us have many contacts over the week-end! And if one or other reader has not tried going out portable, it is one of the real highlights of operating amateur radio just waiting to be discovered!! Saturday is my wedding anniversary, needless to say, given I like being married I won’t be going portable that day. However, I’ll be active on 24 and 47GHz from Mt Cootha looking South on the Sunday morning. Primarily to make contact with VK4OE but sure am open to others having a go. Unfortunately all other microwave bands are in various states of rebuild and the venerable IC970 is now strictly a home based radio hence no portable 2m/70cm/23cm/13cm either. I will set up my portable station (FT-817 and VHF Packer 6m 30W amp), SSB and CW on Saturday from 0100 UTC Saturday morning on Mt Coot-tha. I will be in the 8 hr section but probably won't be there all that time. I will also have 2m/70cm FM hand held listening on the usual calling frequencies. Will be operating my remote/portable station from home tomorrow during field day from QE37LD. hope for activity and beams to the west. baptism sunday so not around. Good to work a couple on the ghz from qf12dc best contacts to vk3alb/vk3acg on 2.4ghz just over 200km! Shame I couldn’t get some of the Melbourne stations point out west. Thanks Matt. Another fun contact on a couple of watts. On 1296 the transverter is a SG Labs and the antenna is a measly Bi Quad inside a biscuit tin. Pictures is my small portable system pointing towards you (not very informative) that I've designed to be quick to deploy. I don't really expect more than 100km range from it so yesterday was a great bonus. Read all about it on my QRZ page. On 2.4 and 3.4 We used a bit more power. 2.4 is my MiniKits transverter feeding a PyroJoe 30W amp into a grid pack. On 3.4 we have the ex VK4GHZ transverter now owned by VK3ACG. This is a XDK transverter with a Tosh 60W PA. No big antenna for it yet but a 3.4GHz panel helps it along nicely. Thanks to everyone who made the effort to join in the fun and double thanks to those who made it out into the field ! A great turn out with good conditions for both weather and radio. 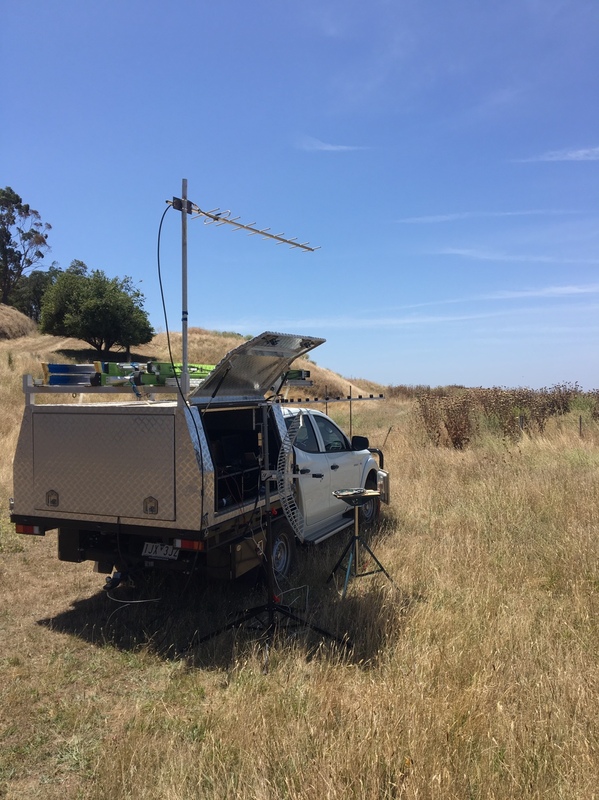 We ran all bands from 6m up to 24GHz, operating from four workstations, being 6m, 2m, 70cm and the last one for 23cm to 10GHz with the 24GHz system being separately operated on a tripod outside of the main operating tent. Below is a brief selection of photos of our field day site. Last edited by VK3BA on Sun Jan 27, 2019 7:25 pm, edited 1 time in total. VK3MAT wrote: Good to work a couple on the ghz from qf12dc best contacts to vk3alb/vk3acg on 2.4ghz just over 200km! Matt, looks like you should take the ride-on mower next time...! Who forgot the chainsaw... I guess there is a gap between the trees ? Whilst we are all posting pictures of the recent Summer FD, here is the image for the VK3ER/p microwave setup. These are fed with individual LDF2-50 heliaxes from the large box which hangs on the mast and contains transverters and amplifiers for 2.4 through 10Ghz and a 1.2Ghz amplifier. From the control box in the tent the system is fed with 145Mhz IF and 1.2Ghz and a 28 volt DC power feed. In the box, there is a 28/13 volt DC/ DC converter as required. Also GPS built in to the box for 10Mhz locking. The box weighs about 25 Kg, so is quite a task to lift it into position - something I need to work on before the next FD! 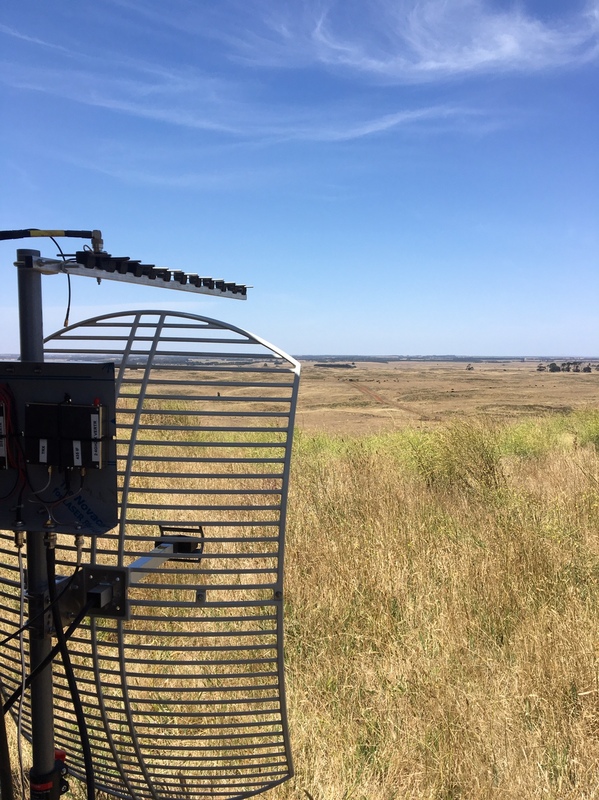 The dish above is for 24Ghz and uses a Kuhne transverter and 3 watt amp and is controlled from the large box as well with GPS locking.